A school has unveiled its fresh new logo. 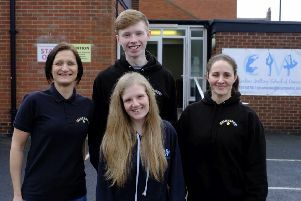 Woodlawn School, in Whitley Bay, has introduced the new logo – along with minor changes to the uniform – to tie in with the ethos of the school and reflecting its inclusive nature. The school’s logo, a tree, has been a long-standing feature of Woodlawn’s identity. Woodlawn school headteacher Gill Wilson and some of her pupils with the new logo. Headteacher Gill Wilson said: “The intricate use of hands symbolises our wonderful staff and parents who enable our young people to achieve their full potential.